Broomfield, Colo., January 23, 2019 - DealersLink, an industry leader in automotive systems integration and networking technology, has announced it will unveil three significant updates to its dealer-to-dealer marketplace at NADA Show Expo, January 25-27 in San Francisco. The NADA Show Expo is the auto industrys premier marketplace of products, services and technologies specifically targeted to franchised new-car dealerships. DealersLink OEM Build VIN Decoding: DealersLink continues to move the innovation needle by offering factory equipment stocking technologies. As a result of this update, dealers will experience a completely hands-free booking process. After a VIN is entered, ExportPro will auto populate equipment, packages, factory color and complete vehicle specifications for all online listings. This update is designed to reduce considerable time in building VDP's (Vehicle Detail Page) and merchandising vehicles. 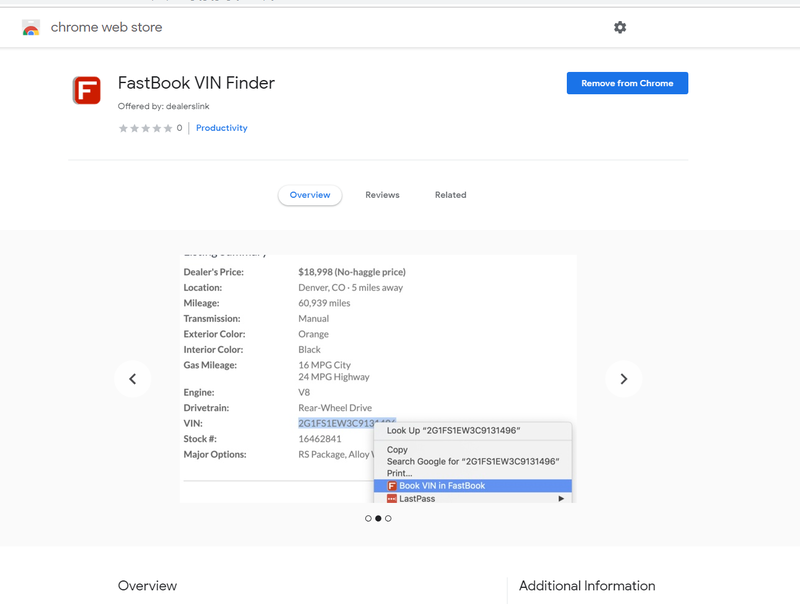 FastBook Chrome extension allows users to quickly identify a VIN on any webpage and book it in FastBook with the click of a button. FastBook Chrome Extension: This extension allows users to quickly identify a VIN and send it FastBook with the click of a button. FastBook was already the fastest and most effective VIN-capturing device available. This latest update makes the tool even more useful in multiple online Dealer environments, including online auction sites and OEM lease return sites, resulting in increased appraisal efficiency. "These updates represent yet another major step forward in dealership efficiency for our members," said Matt Childers, performance manager, DealersLink. "Beyond that, they can eliminate the need for additional auction tools that dealers have traditionally spent thousands of dollars on."